In the introduction to this famous book, Leach writes "I have tried to formulate a criterion by which good pots may be judged ..." His proposed standard of excellence is chiefly covered in Chapter I but reinforced throughout the book.. Chapter II broadly introduces raku, English slipware, stoneware and porcelain as representative wares fired at different temperatures. The rest of the book is mainly technical except for the concluding chapter, which describes the daily activities of a pottery in the form of imaginary letters to a friend. Most of the technical information is detailed and useful except for the material on lead-based glazes, which have become environmentally incorrect. Western students dont really need to read the book for the other technical information, which has been transmitted by their teachers and through numerous other books in English. It is interesting, however, to hear these points again "from the horses mouth." As for the aesthetic content, I can say that I have found the book to be remarkably free of obvious distortions, and I have therefore come to the conclusion that Bernard Leach really knew what he was talking about, even if I do not fully understand him yet. Bernard Leach was born in China, educated in England and then returned to the Far East to teach etching techniques. In 1911, he happened to attend a garden party in Tokyo where the guests decorated raku pots and got to see them fired before leaving. Something about this experience resonated with him. Leach soon found a pottery master, Kenzan VI, and studied hard under him until the old man died. Leach and Tomimoto, another of Kenzans students, explored the fusion of English pottery traditions with Raku. Leach also mastered other pottery styles and gave annual exhibitions of his pottery, drawings and etchings in Tokyo until 1920. Then he returned to England to establish a pottery with another Japanese artist and potter, Shoji Hamada, who had also investigated glazes scientifically. Leachs fame spread over the years, and now he is recognized as having done more than any one else to establish pottery as one of the visual arts in the West. Leach relates that around 1915 he visited the Tokyo Museum and was awed by magnificent examples of Sung Dynasty pots displayed there. He writes about accepting the Sung Standard as "a striving towards unity, spontaneity and simplicity of form." We can get an idea of what he might have seen by visiting the Tokyo National Museums web site. The picture on this page is of one of the Sung Dynasty tea bowls featured there . I can easily agree that the form of this bowl is not too complex. The other two attributes are somewhat more difficult. None of this tea-bowls parts seem to be in obvious conflict with one another, so that could be a start on what Leach means by unity. Spontaneity of form is the most difficult and raises thorny questions. For the remainder of this review, I will examine a few passages in the book related to these concepts in order to better identify what Leach may have meant by them. although the shape of a pot may be suggested by a decorative motif, the more natural process is to conceive a pot for a definite purpose and then consider what pattern, if any, will give to it an added beauty." "... a pot starts by being an abstract shape, and consequently any pattern applied to its surface calls for formal emphasis in order to attain unity with it." "It will be noted that the inside of the foot is a continuation of the main lines of the pot, and that a satisfactory termination of the form at this point is of great importance." "Enduring forms are full of quiet assurance. Overstatement is worse than understatement." I think the tea bowl in the picture has this quiet assurance. "The briefest movements of the best available tools are discovered for each job by a process of natural comparison and elimination, and they become part of the ritual of a tradition which leaves no time for self-conscious hesitation." "excessive self-consciousness, or what is often called pose, a very different thing from the unconscious, inherent, personal and race character which has distinguished all the great periods of creative art." This tendency unfortunately increased as the last century progressed. Far from being vindicated, though, Leach has recently come under personal attack  for having praised the unknown craftsman while being a very well-known one himself. sincerity is what matters, and according to the degree in which the vital force of the potter and that of his culture behind him flow through the processes of making, the resulting pot will have life in it or not." Bernard Leach, A Potters Book, Second Edition, Faber and Faber, London 1945. 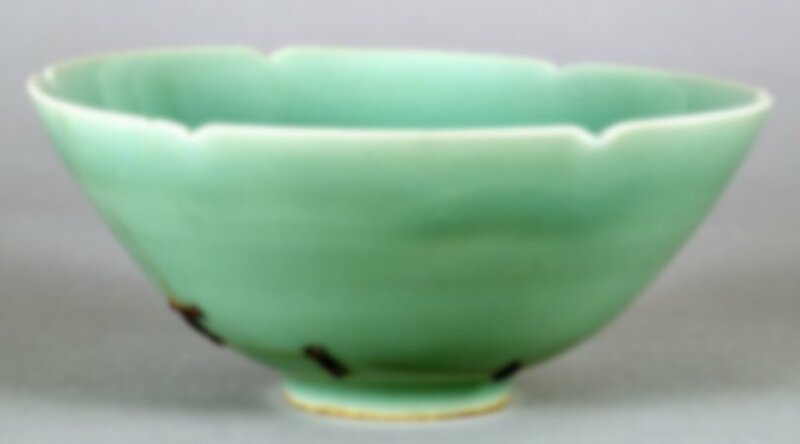 Tokyo National Museum Celadon glazed tea bowl from the Southern Song Dynasty, 13th century, known as "Bakohan." Designated an Important Cultural Property. Dimensions H. 9.6, mouth D. 15.4, bottom D. 4.5.